The venetian blinds design features make operation simple and convenient, with a control mechanism that allows you to position the blinds at any point on the window. Improved aesthetics give you control over both the amount and direction of light, perfect for any room where light control and aesthetics are important. 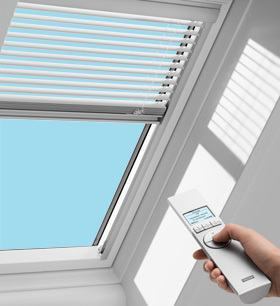 If you choose a VELUX venetian blind, you will enjoy style and comfort. No longer is direct sunlight an issue. Perfect for rooms when directed light is desired. All blinds listed on this site for for Velux skylights from 2010 and newer. Please call us at 1-800-900-0759 if you are looking for blinds made for skylights older than 2 years. Older blinds are no longer manufactured by Velux and are extremely limited in availability.